We got going at 6:50am with the goal of a big day to get to a camping spot between two upcoming forests. Our days are totally dictated by where we can camp. There is a Te Araroa fb page for each class/year. Someone on the fb group mentioned that there are two different people who let hikers camp in their yard between some upcoming forests. We knew it would be a full day, but wanted to go for it. Most of the day was smooth sailing with flat road and beach walking. 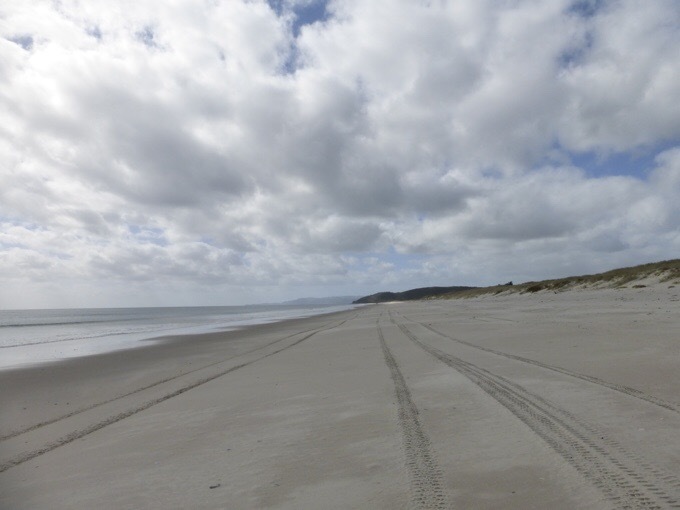 We left Mangawhai Heads, and it was another hour to Mangawhai, where we had hoped to make it yesterday. It was a nice village that was quite quiet on a Sunday morning. I really enjoyed the pathway along the road between the two towns. It would be cool if something like that could be made on more of the highway road walking stretches. 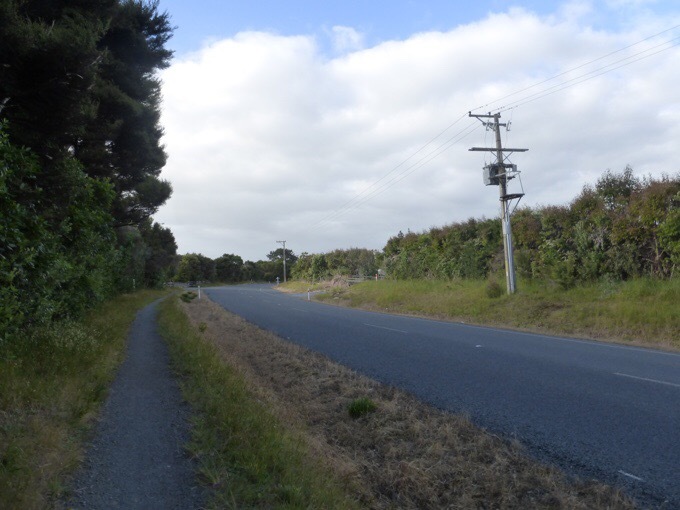 In general, there isn’t a ton of traffic on NZ roads, but I can sense the annoyance from both the drivers and hikers sharing such limited space on often winding roads. We spend a lot of time criss crossing back and forth on winding roads to be more visible on the turns. 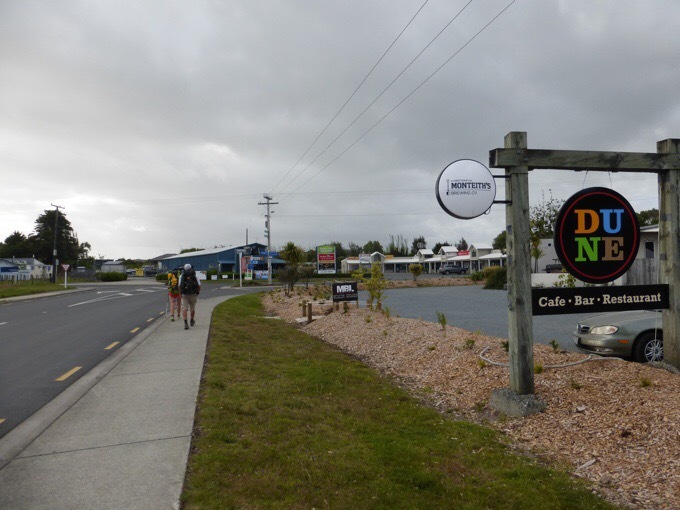 I have to mention the public restroom in Mangawhai. It’s a sliding door that then speaks to you to welcome you. Then you push a button to lock the door and it tells you that you have 10 minutes. Then nice elevator music proceeds to play while you’re in there. Once you’re finished and unlock the door, it thanks you and says goodbye. Becky said they have timed public toilets in Germany to prevent drug usage in them, but that they don’t talk and play music. It seemed to be also run on solar power, which was cool too. 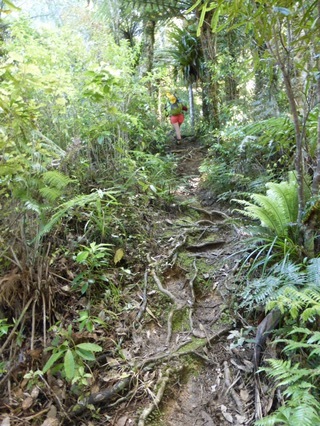 After town, we walked on the Mangawhai Forest Track, which was a dirt and gravel road through a sparse forest. I totally forgot and spaced on taking a photo. It had a bit of traffic on it given that it was a Sunday, but it was mostly quiet. 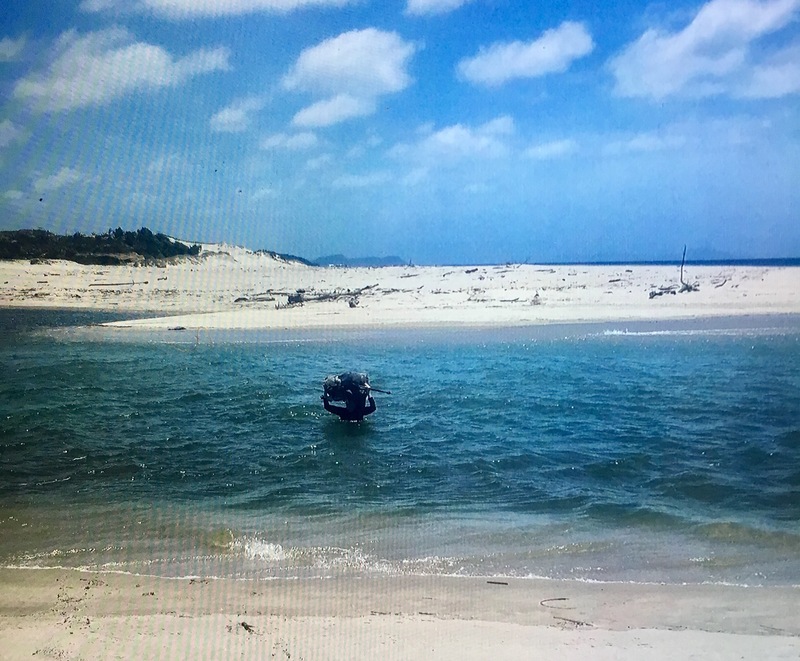 When we reached the car park at the beach, a car drove up and a hiker got out. It was Nathan who had also camped where we did, but he is one that doesn’t mind hitching the roads, so he slept in this morning and got a hitch partway. The four of us were together much of the day. The beach was a nice cruise. I enjoy these walks, but some find them never ending since we can see our destination far in the distance. 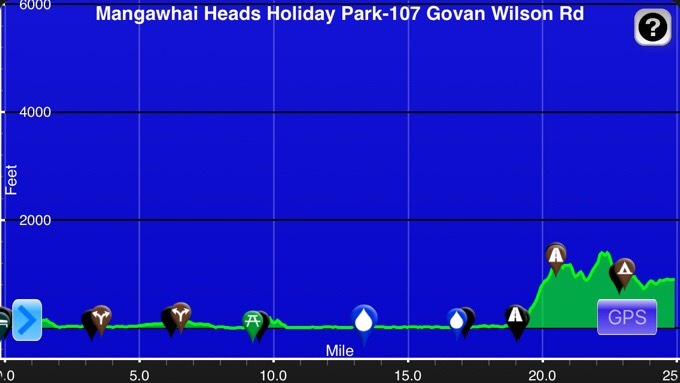 Today was over 8mi/14km of beach walking. 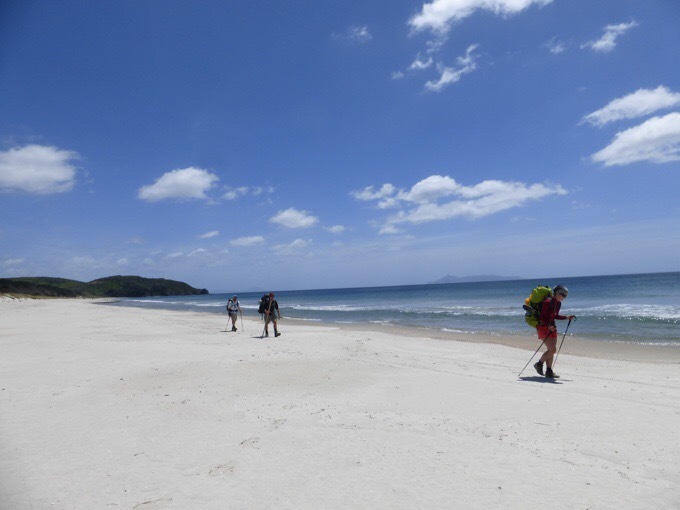 About halfway through the beach walk, we reached Te Arai Point, where the track briefly comes up off the beach and over a hill for .5mi/1km or so at a point that seems impassible if the tide is high. It was low tide and seemed simple, so we decided to avoid the hill and see if we could just walk around the point at low tide. Big mistake! It was a time consuming scramble over sharp rocks as tide was coming up. 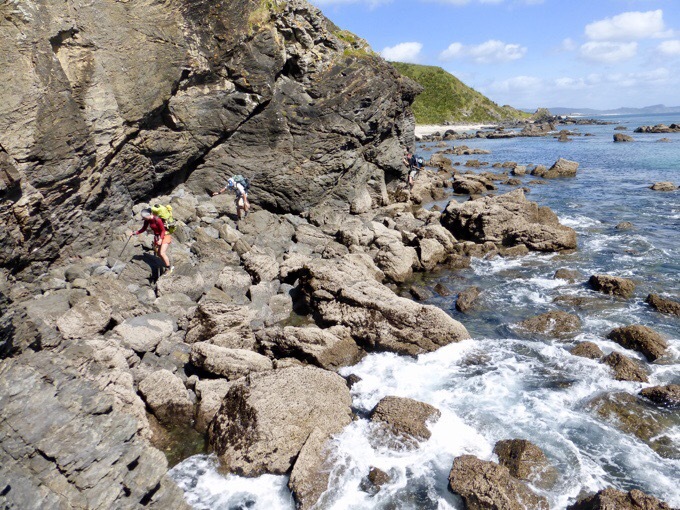 Becky, Will, and Nathan trying to get around Te Arai Point. 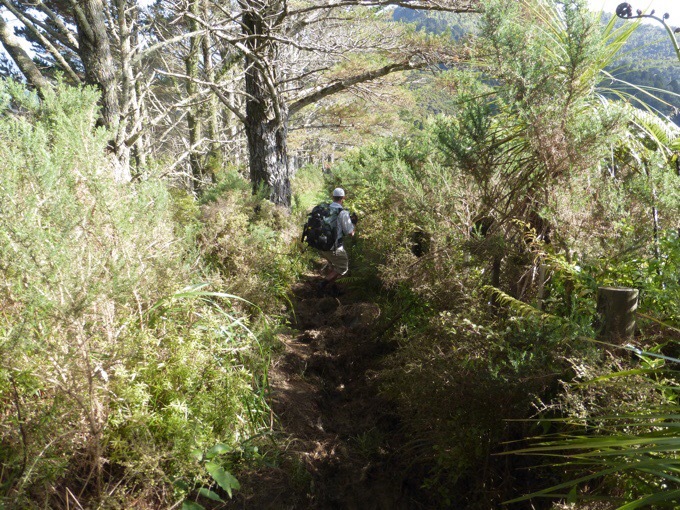 Towards the end, we turned a corner and reached an impassible spot and had to turn around. The tide was coming in, so we got wet feet. I saw a possible way up and over rather than backtracking the whole way and went up with Becky while the guys smartly played it safe and chose to backtrack. 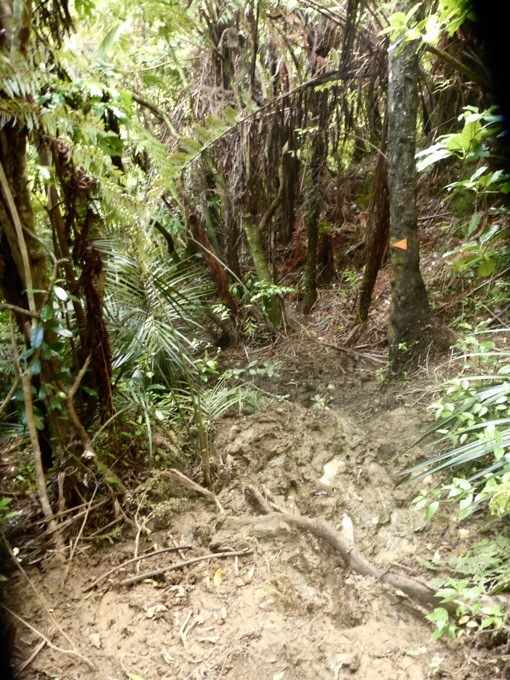 I knew it wasn’t far to hit the track above us, but the problem was the bush we had to go through to get there. I have done a lot of cross country and felt bad for dragging Becky through that. I had pants on and she had shorts as we went through a lot of bush that involved our first interaction with gorse, a pokey type of bush, that some seem to have a reaction to. By the time we got out, poor Becky was covered in scrapes and quickly got a full body rash from the gorse. Oh man! She handled it well, and I’d heard of this reaction before from a friend, so it was good to know it happens to some. We did save a lot of time not backtracking, but it wasn’t worth what Becky had to go through. Will and Nathan showed up and we took the opportunity of shaded picnic tables to have lunch before the rest of the beach walk. Some people gave us water and Becky tried to rinse her legs, but it burned. Oh man, I felt bad! She handled it so well. It did clear up as the day went on, but we had two saltwater crossings along the beach and the scrapes burned from the salt. Lesson learned, stick to the trail! 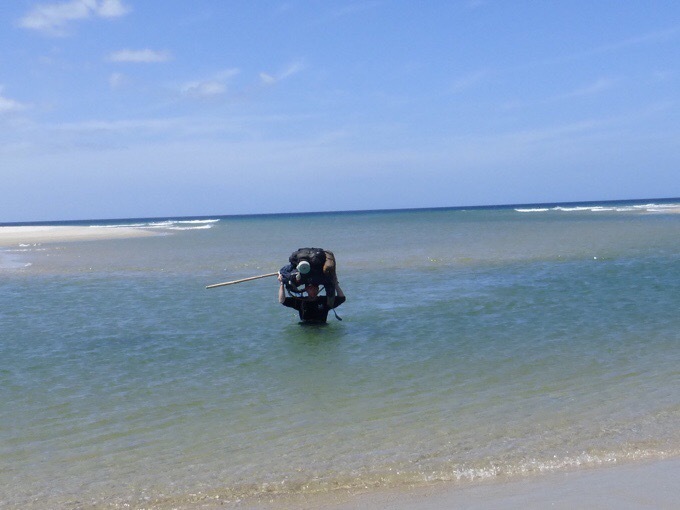 There were two major river mouth crossings the second half of the day. Both ended up being quite deep, but not dangerous. Since the super moon, the tides have been higher than usual. Plus, they seem to have had a wet winter, so we seem to be having higher than normal water experiences. For the first crossing, Will was our test bunny. He dry packed all his important things and forged on with his pack held over his head. We watched as he got deeper and deeper and as waves lightly rolled in making some moments deeper. Right at the far end, it dipped down and he was chest deep. Dang! Nathan went on and then Becky and me. Becky wasn’t able to lift her pack over her head, but had things dry bagged in a couple trash bags in her pack. I was able to do my pack over my head and the water got as high as my armpits. At least there wasn’t a strong current, so it was easy to stand up through. Becky got a shot on her phone of my armpit deep experience. It’s a photo of the photo, so not the best quality, but you get the idea. Will crossing the first river. The next crossing was at the end of the beach. This one was visibly deep. A local surfer kindly offered Becky a ride over on his surf board and did another trip over to get her pack, which stayed mostly dry. I wanted to keep my pack dry, so I crossed with it over my head again. This one was chest deep and had more of a current to work against, so it was more tiring. 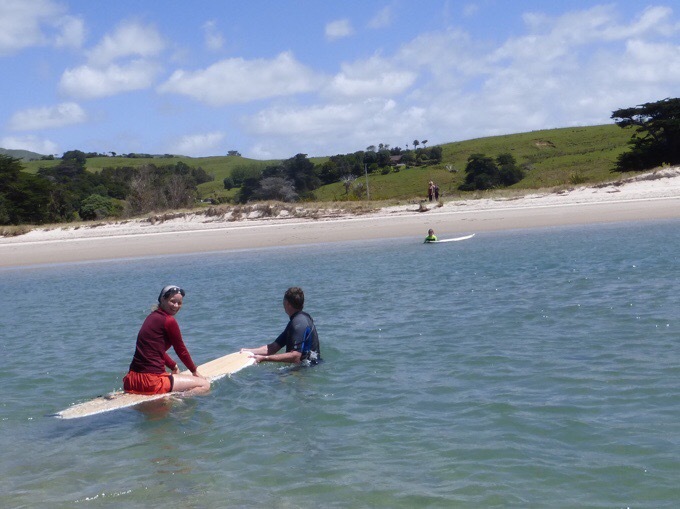 Surfing on the Te Araroa! Nathan crossing the final river. 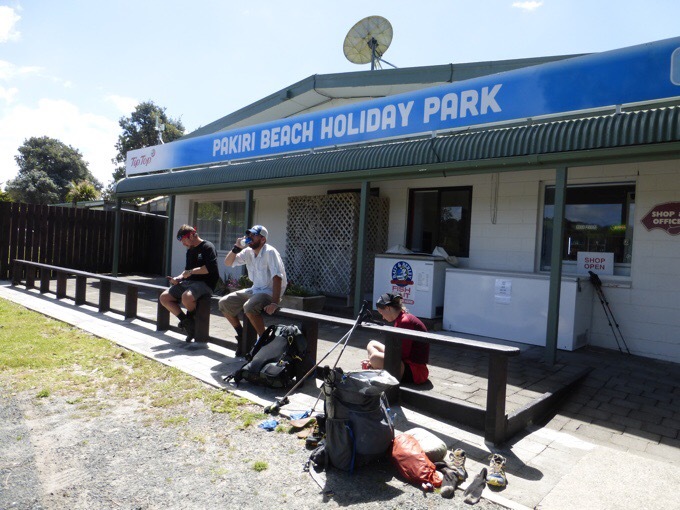 There was a Holiday Park (pay only camping and caravans) at the end of the beach and we knew the hardest part of our day was ahead of us. We took a break and got drinks and ice cream. No soda withdrawal for Will and Becky! We had a bit of road walking and then 5mi/7km of a tough forest track ahead. I’ve been using my friend Why Not’s TA Journal from last year to have a heads up on things and guesstimate mileage each day. It has been invaluable to have her journal as a guide. I have it loaded offline on the Pocket App and read ahead each leg to know what to expect. It’s helped immensely. THANK YOU Why Not! She mentioned the end of this track being ridiculous, so we knew to expect it to be slow going. 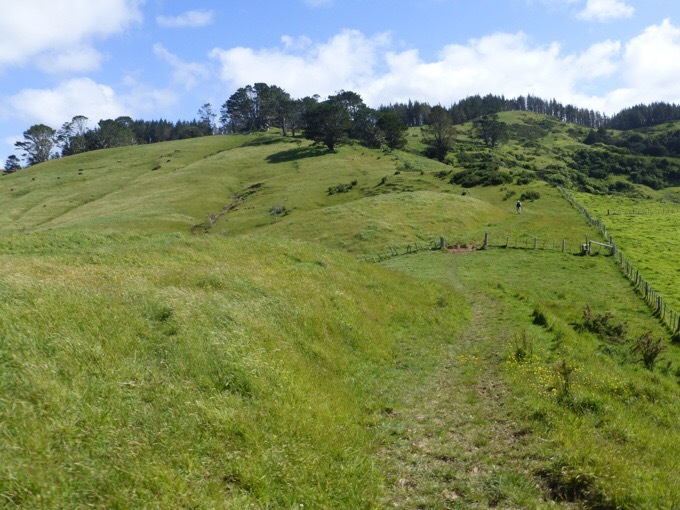 It started out with a steep grassy uphill climb and soon changed to a narrow kind of drainage almost that was muddy, but thankfully not as bad as it could be since it’s been a bit since it rained hard. Nathan has a sore foot he’s been nursing, so the three of us hiked on spreading out at times. We reached the top and were ready to be done for this long day, but the worst was yet to come. I took the lead with Becky and blazed right by a turn with a sign I didn’t even notice. We ended up on pretty nice track, and a couple hundred meters down it, Becky questioned it and mentioned the sign. I looked and yes, we were off trail! That’s a really tough thing to swallow at the end of a long day and knowing we had to go back uphill. Dang! 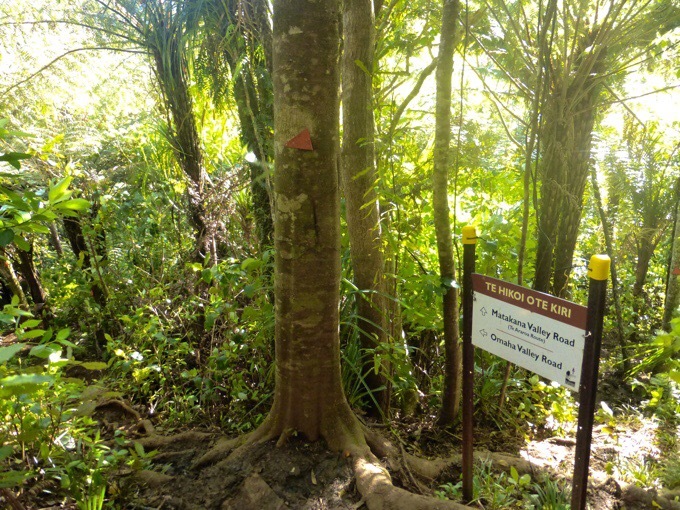 I went back and realized the sign, which I didn’t read at all was a warning telling people the TA was a faint muddy area behind the sign and not the beautiful track with the big arrow pointing to the left! Lesson learned, read the dang signs and not just the arrows! No, the TA does NOT go left here. It’s the hardly discernible path behind the sign. I totally saw the arrow and didn’t read the sign and blew past it. We follow orange arrows, so I assumed we were on track. Turns out these arrows are slightly more reddish than our orange ones. Ugh! Well, at least Will made the correct turn behind us. That put him unknowingly ahead of us, so I sped ahead and caught up to him to let him know. That track was ridiculous and I wouldn’t want to see it in rain or more mud. Our shoes and legs got plenty muddy as it did a rollercoaster of a mud slide for a very long 1.5mi/3km that took us about an hour. Just at then end, when we thought it was done, it went back up super steep and muddy. Just a draining end to a long day. We had about a mile more of walking until we reached the house where we heard we could stay for the night. We made it at 7:30pm. 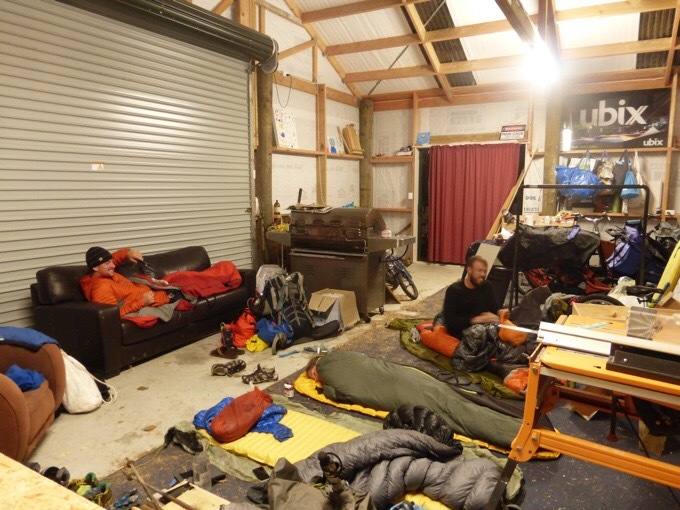 Matt is the host and has opened up his place to walkers the last three summers. It’s awesome! 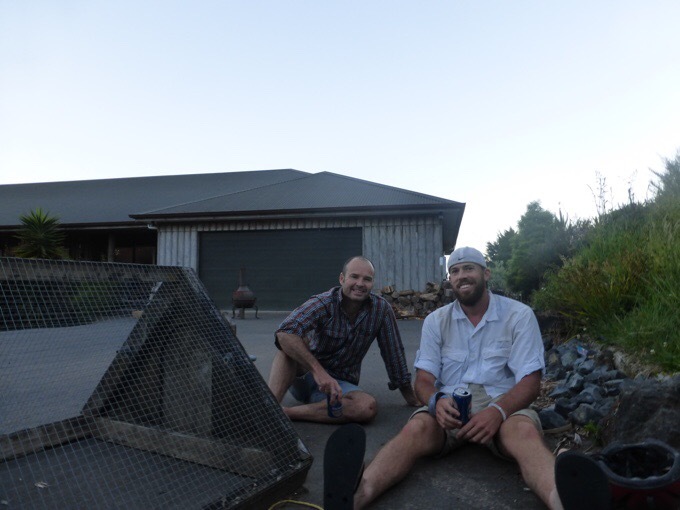 Word is spreading and he is going to reach out to the Te Araroa Trust to get it on the trail notes for all to see. His house is 107 Govan Wilson Rd. He offers camping in his yard and also has a huge garage that hikers can sleep in. We happily took the garage as this is the coldest night yet. No other night has been cold and it definitely is up here. Matt has four kids and it’s amazing that he takes the time to help out walkers. He even offers up showers and a beer for everyone. He hopes to add more amenities each year. THANK YOU Matt for being so welcoming to us stinky muddy walkers! Nathan made it in just before dark thankfully. It was quite a tiring day, so we all crashed as soon as we could. Whew, just three days till Auckland and my first zero day all trail! I hate bushwacking! Good on Becky for being such a good sport inspite of it all. 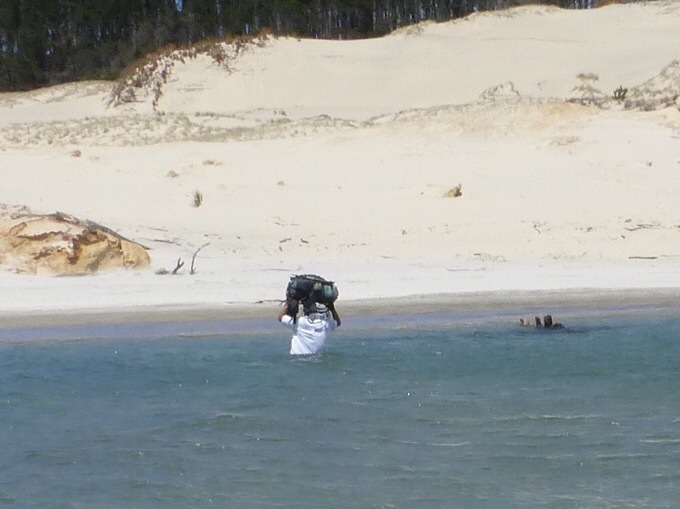 Part of the lesson learned to stay on the trail is that when you are skirting an ocean on rocks at the waters edge is that the tide can sometimes come up and fill in quickly and leave you in a very dangerous situation. If there is swell with that quickly incoming tide, the waves can easily come up and sweep you off what looked like a safe place to walk. Take that into consideration from a concerned waterman; the safety the extra walking provides will at least won’t kill you!!! Hey Erin great narrative. Feels like I am walking with you. Pleasure having you all stay. Travel safe. I knew you’d like it! Really let’s you in on what we’ve gone through before arriving at your place. Love living through all the craziness of the TA again!! I find I am constantly nodding my head remembering this or that as I’m reading. As you know, there are a few more tide-dependent areas coming up (a big one past Stillwater), as well as urban areas. 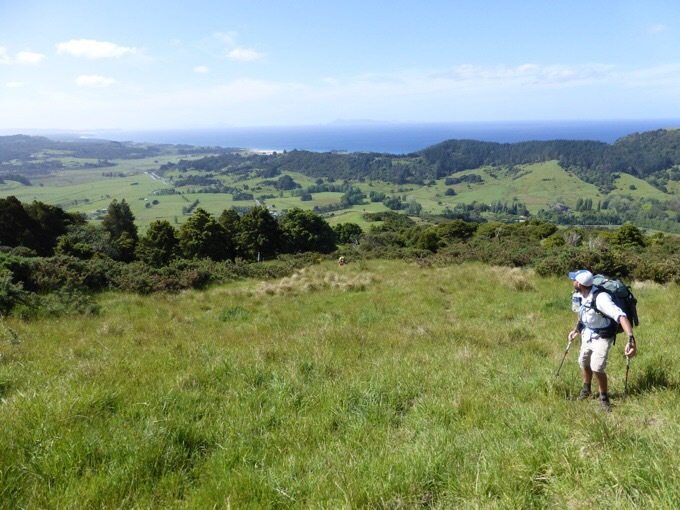 I recall being so frustrated in this section having this all dictate our hike, but just know it is short-lived and once you are past Auckland, you can be more flexible and go with the flow. Oh good! It is for sure very frustrating. I’m really looking forward to that! I am impressed with how much distance you can cover in a day, with so few breaks. I find 20ks to be a good hike and 30ks pushing it. Yeah, I’ve found the key is the early start. It’s amazing how much can happen when I get a good start. It’s nice to read that my blog is still helping. I remember that stretch of trail well. I thought I read that they improved the trail in that area….. I guess not if it was still ridiculous. How does our daily mileage compare? I was chasing Nathan at this point which upped my daily totals. Plus all the variables (tides, sleeping options, towns, etc) makes for lots of scheduling adjustments. Keep enjoying it. The TA is a unique beast. Um, you killed it through the forests! There was that day you left Tidesong that you did that huge day and we had to bow to you on that one! Then the day you ended on top of the Dome, whew! I’m trying not to break Becky and Will, so we are doing less hours than you, but your commentary helps us gauge things greatly! Ha, ha. I had some big and LONG days. The road walks sometimes seemed like the least crazy of it all. Enjoy the walk into Auckland, and your zero there. Just be careful that you don’t get stuck paying $50/tent. Seriously. Where was that!? It better not be where we’re headed. You mention getting a deal there and staying in the pool room. Hook me up! The pool room is awesome. Especially since it rained really hard that night. The expenaive place was much closer to Auckland. Just got ahold of them and can’t believe it’s free! Finally! We also got a free shower! Hope you do too. We did! And 500MB of wifi! And we had an awesome dinner at the boat house right before the Holiday Park.